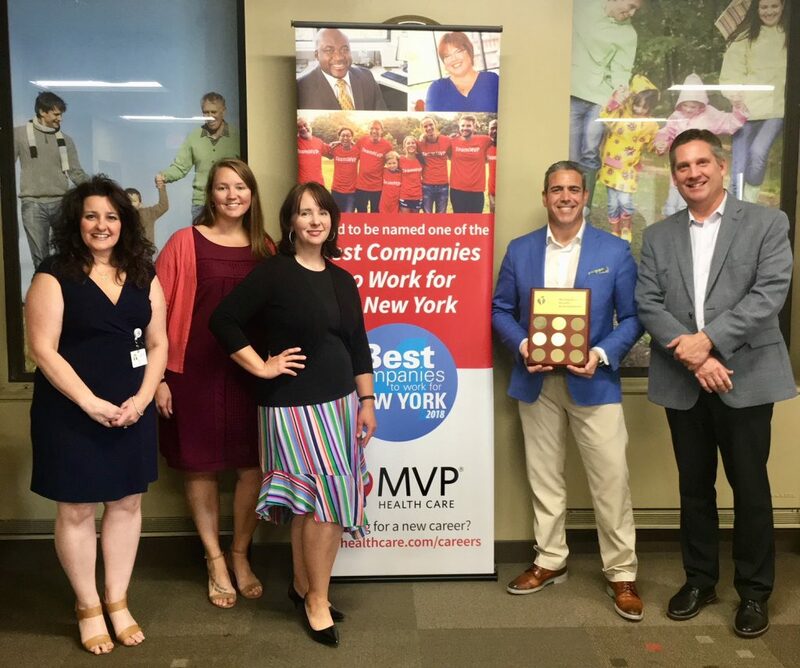 Schenectady, N.Y., October 2, 2018—The results of the American Heart Association 2018 Workplace Health Achievement Index have been announced and MVP Health Care achieved gold level recognition for taking significant steps to build a culture of health in the workplace. Angela DeFeo (MVP Health Care human resources), Jen Maser (MVP Health Care marketing & communications), Jen DiMarzio (MVP Health Care marketing & communications), Marc Natale (executive director, American Heart Association), Patrick Glavey (executive vice president, Medicare programs at MVP Health Care and AHA board member). MVP attained silver level recognition in 2017. This year’s gold level recognition reflects MVP’s sustained focus on creating a healthful workplace, and the success of the programs and services it brings to employees. The American Heart Association’s Workplace Health Achievement Index allows companies to measure the effectiveness of their workplace health programs as well as the overall heart health of their employees. Unlike other existing organizational scorecards, the Index also scores companies on the heart health of their employees based on Life’s Simple 7® – the American Heart Association’s scientifically validated definition of ideal heart health. The assessment is grounded in data-driven science and a quality improvement framework. According to the Nielsen 2016 Employee Health Survey, robust and comprehensive strategies for well-being are associated with positive impacts on employees’ health. More than 1,000 companies completed the Index assessment this year and, of those companies, 75 percent received either gold, silver, or bronze recognition. Companies receive benchmarking reports, which allow them to identify potential areas of improvement so they can advance their annual performance and recognition in the index and help their workforce move toward ideal heart health.